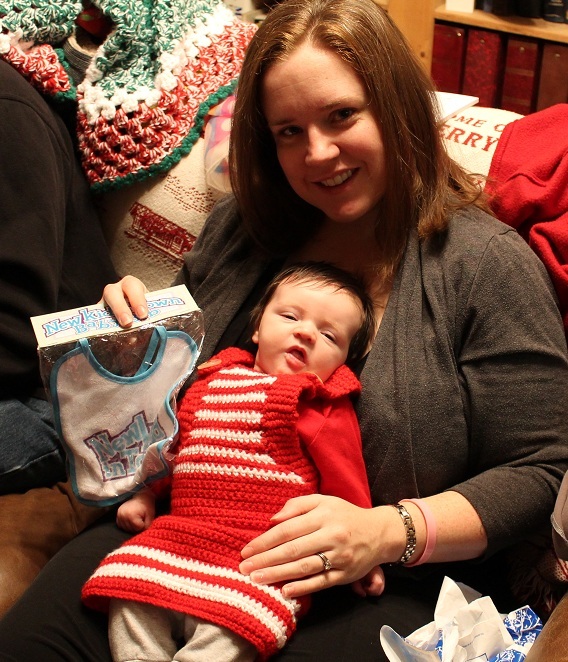 Crocheted Christmas dress by me! Jane's first Christmas was a smashing success, of course. We made it to Oklahoma and back with beautiful driving weather on both of our travel days. Spending time with my family and getting to see many friends at Jane's baby shower were really the best parts of the trip. Having a happy baby 99% of the time was pretty swell too! The temperature difference from Oklahoma to Louisiana is extreme. I enjoy bundling myself up and feeling the nip of cold air on my face, but wrangling a baby into a car seat in the freezing cold is not my idea of fun. I tried to start traditions of our own this year -- the most ambitious being a Christmas book each night in December leading up to Christmas to serve as an Advent calendar. Originally I was going to wrap 25 children's books, but then I realized that was ridiculous, as I'd be wrapping and opening them myself. So I just went with the pile of books and tested them out that way. My mom gave me a whole slew of books that we'd had as kids, so it was fun to read those especially. I remember the big basket of Christmas books and being excited when they came down each December from wherever they lived the rest of the year. 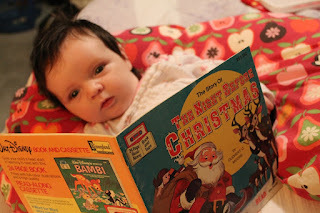 So this year I read a children's Christmas book almost every day. But as we were getting into and out of a routine/schedule/whatever I didn't always remember. Next year I hope it will be exciting for Jane and an easy part of our routine to implement. Also, I read something on my pastor's blog about Christmas being the beginning rather than the end. And what would our culture be like if we celebrated most the 12 days between Christmas and Epiphany? So perhaps I should extend my book reading beyond the 25th of December? I have saved the Wise Men books that we have to read on January 6. I definitely want Jane's experience of Christmas seasons to be full of wonder and joy without the trappings of gimme-gimme-gimme materialism and Santa Claus. I know that will be tough in our culture, even in our church culture, but it's something to strive for. Hopefully in future years we will add traditions as she develops -- more crafts, baking cookies, etc. But I never want to forget THIS Christmas, especially seeing Jane getting to know my Gran -- they love each other so much. And I love THEM so much that it made my heart happy. I only wish we lived closer together so I could have that heart happiness more than once or twice a year. Disclosure: Amazon affiliate link used for car seat. This gave me lots of laughs. I didn't seek it out, just randomly found it in the non-fiction section at the library when I was looking for Babywise (never found it even though the electronic card catalog said it was on the shelf). This book made me a bit nostalgic for Mad About You, as Paul Reiser has the same sense of humour in the book as he infused into that show. It's just a good, funny memoir about becoming a parent. Enjoyed it. Another fun parenting memoir -- which I found at the library on the new biographies shelf by the checkout. I loved Punky as a kid (one of my best Halloween costumes was as her ... although I lost my knee bandana and that still haunts me). She wrote the book sort of with the help of her Twitter followers and Facebook fans -- the start of each chapter has quotes from those people responding to questions about parenting. I kind of skipped over those, but otherwise liked reading about her life, her pregnancies and deliveries, and her parenting strategies. Fun read. Jane has gone from being "so big" to "so small." She's still growing, filling out her clothes, and I'm sure keeping up her high percentiles in weight and height. It's all relative, or perspective, or something. When you have actual kids running around it's hard to remember them being so tiny. And I know relative to those kids Jane is. And I find it hard to believe that I will forget -- although I almost certainly will. How can I forget the feel of her little body melting into mine as I hold her and she drifts off to sleep? The way she fits so perfectly into the crook of my neck? How can I forget the way her little diapered bottom fits right into the cup of my hand? It's perfect for patting. How can I forget her newborn hair -- so soft and staticky? 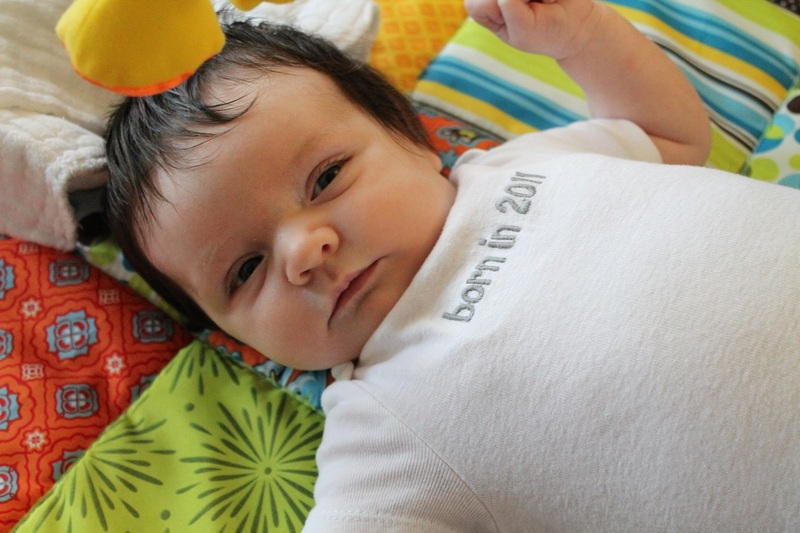 How can I forget her newborn smell -- milky and diapery? And the sweetest breath in the world? How can I forget her sweet coos, grunts and cries? I know has her language develops it will be harder to remember, although I can still hear Owen's gurgle giggle and it's 7 years later. I know what I'll never forget about Jane is how much I love her. It's ridiculous and deep and the best thing ever. I don't want time to fly by so quickly, but I know I can't grasp it or stop it. So I'll try to mark it where I can. Hoping that in words I can help myself remember that yes, she was this small. And she's always been so lovable. 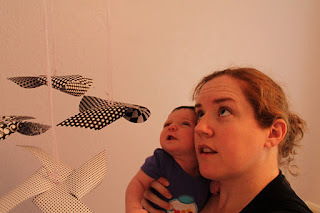 I made Jane a pinwheel baby mobile, thinking it would be clever and cheap. Uh ... between what was spent on a couple versions of fishing line (that I gave up using in the end), the star brads, the scrapbook paper and embroidery hoop it was probably about the same cost as a store bought mobile. The yarn is from my stash. But now we have it, and Jane seems to like it OK.
Basically I cut down 12x12 scrapbook paper to 3x3 squares. 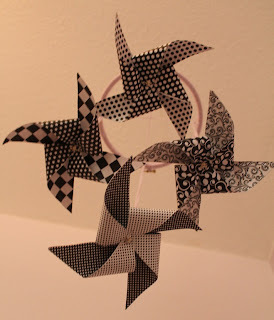 I used double sided tape to put two designs together then followed this tutorial to make pinwheels. I wrapped the embroidery hoop with the yarn, and then after trying and failing to assemble the mobile with fishing line I used the yarn to connect the pinwheels to the hoop (using graduated lengths) and to make a loop at the top to hang from the eyelet hook that happened to be in Jane's ceiling. For not being very complicated it sure took me a long time to get it completed (I started this early in the third trimester). I didn't think the pinwheels would turn because the brads were too short to allow that. But the yarn itself twists and the pinwheels can spin up if you blow them and then spin the opposite way as the yarn unwinds itself. And I've got tons of black and white scrapbook paper leftover to play with.